1. Preheat the oven to 180°C, gas mark 4. Spread the nuts out on a baking sheet and roast for 8–10 minutes until golden brown. Leave to cool completely. 2. Put the nuts into a food processor with 1 tbsp of the sugar, then pulse until finely ground. Tip out and set aside. Whizz the remaining sugar, butter, egg yolk and vanilla until creamy. Add the nuts, flour, cinnamon and orange zest and pulse to make a ball of dough. Split the dough into one-third and two-thirds, press each into a disc, then wrap in clingfilm and chill for 30 minutes or until just firm. 3. Roll each pastry disc between 2 sheets of clingfilm. 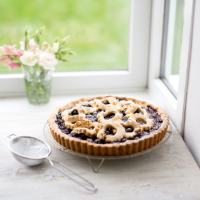 Use the larger one to line a 23cm fluted tart tin, making a lip of about 2.5cm up the sides. Spread the jam across the pastry. Mix the blueberries, orange juice and cornflour then tip them on top in an even layer. Stamp out 5cm rounds from the smaller disc using a fluted cutter, then use a very small cutter to remove the centre from each. Arrange the pastry rings over the fruit, overlapping them slightly, then bake for 35 minutes, until the pastry is golden and the berries saucy. 4. Cool in the tin for 5 minutes, then remove to a wire rack and leave to cool completely. Dust with icing sugar and serve in slices with crème fraîche. This recipe was first published in Wed Mar 02 10:56:00 GMT 2016.